Again St Helen and St Katharine School came to help two communities in the south of Swaziland to build playgrounds for care points, one in Madacaze and one in Mbowane. The team worked alongside the local community and also Shamba Trust who had initiated the development. The care points are for AIDS orphaned and vulnerable children in the communities and will be somewhere for children to go for pre-school education as well as for a safe and secure environment. The girls designed the playgrounds and got the opportunity to order and purchase the equipment needed. They also immersed themselves into community life, went to church, played with the kids and were invited to visit the chief. Memories for a life time. With the current situation with AIDS in Eswatini the population dynamics has shifted meaning that there are more elderly people who no longer have sons and daughters to look after them in their old age. Again students from St Helen and St Katharine School came to help. They raised money to build and pay for two of the 24 rooms planned for an extensive Old Age Home in Section 19 in north east Eswatini. This project is the beginning of a long term construction where there will not only be enough room for 24 people but also a garden, kitchen and lounge area, all next to the Care point where young and old can mix. This is in conjunction with the Christian Family Church of Swaziland. 18 students from St Helen and St Katharine School travelled to Eswatini to help start a much needed High School in Mhlumeni community on the Mozambique border. At the moment High School students have to travel over 20km to get to Siteki for further education, many of which can not afford the buses and often resort to hitching. The initiation of a High School by a community has not been done before in Eswatini and new challenges were faced in order to get the government and relative departments on board. The community fund raised towards their goal as well as getting other donations. In conjunction with this the existing pre-school was revamped as well as bricks made for the new High School, the area was cleared and fenced to demarcate the boundaries. 14 students visited the Mlindzini community and this time they paid for and helped construct a kitchen. The previous kitchen was no longer there and the store room was being used as a kitchen, which mean that one of the classrooms was being used as the store room. The ripple affect would be incredible for the community. The students also built on the existing bonds that have formed with this incredible partnership between the community and Abbey Gate College. There are many years to be had with this and it is wonderful to watch this grow. Once again 16 students from St Helen and St Katharine School travelled to Swaziland, this time to build a resource centre for AIDS orphaned and vulnerable children in the area. Many of the children do not have the opportunity to do their homework in the light or with assistance as once home they have other jobs that need to be done first, and by the time there is a window to do their homework it is dark and they have to do this by candle light. The aim of the resource centre for it be a place for children to come and work in a lit classroom, to be safe and to even get access to computers. With a resident teacher to be there to assist with children and adult development in the afternoons, this place is going to be a wonderful hub of activity for all ages. 14 students from Abbey Gate College travelled to Swaziland to participate in a really important project of building a kitchen. The old kitchen in fact blew down only 6 days after the new one had been built, so very timely. The cook had been very ill due to smoke inhalation and feeding 80 children on top of a mountain was very difficult over an open fire. Abbey Gate College is twinned with Mlindzini High School and this will be a long lasting relationship with teachers of Mlindzini already having visited Abbey Gate College. This was very evident with the reception the team got by the teachers, students parents and committee members of Mlindzini, very humbling. 19 girls form St Helen and St Katharine School travelled to Swaziland to build a soup kitchen in Mgidza community. A lady called Sophie had been cooking for 80 children over an open fire in her own homested and it was time to give her some space and somewhere she could cook without inhaling the smoke from the fire. She had been doing this for over a year. The money the girls raised paid for the whole kitchen and an indoor seating area. It also funded the builders. The girls helped mix cement, lay the bricks, mix plaster, skim plaster on the walls and then once dry, painted the whole building in a day. They also started the pre-school teaching, or which some of the parents attended, and enhanced the social interaction of the children. Such a rewarding experience for all. 17 girls form St Helen and St Katharine School travelled to Swaziland to build the second of two classrooms in Njojane community. The children were very excited to see more students from the UK coming to assist them! The girls worked hard in mixing cement, laying bricks, levelling the ground, building the veranda as well as painting the previously built classroom and designing educational murals. They also played a lot of netball, of which we did not do too well (!) and helped at the feeding station . The team went to church and astounded the locals with their wonderfully harmonious singing. The Swaziland Tourism Authority thanked the girls on behalf of the Kingdom. 9 students from Abingdon School and St Helen and St Katharine School formed a joint expedition to Njojane to build the first of two pre-school classrooms. The community welcomed the students with open arms and as they stayed on site they became immersed in the teaching and the after school activities as well. They not only mixed cement and worked on the site for 10 hours a day, they also helped at the feeding station, played football and netball and they also were taught siSwati each evening. The Swaziland Tourism Authority said that they were humbled at the ethos of the students and amazed at their generosity. 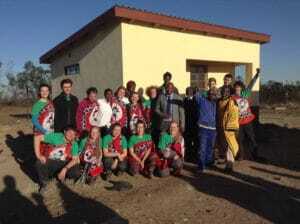 19 Students from St Helen and St Katharine School travelled to Swaziland to build a skills centre for women in the Siteki and Lonhlupeko region. This was in conjunction with Christian Family Church of Swaziland. The girls spent 10 days flattening the foundations, mixing cement, laying bricks and generally supporting the builders on site. It was a mammoth project and the ladies who were going to benefit from this project were delighted with the building. The building would also double up as a church on Sundays. The girls also painted the pre-school classrooms, helped feed AIDS orphaned and vulnerable children and attended a church under the corrugated shelter next to the kitchen. 9 Students from St Helen and St Katharine School travelled to Swaziland to build a National Care Point Kitchen for AIDS orphaned and vulnerable children. This was identified by Shewula community and local women, men and children assisted in the building. The kitchen was built from the foundations upwards and the girls learnt new skills such as mixing cement, plastering, levelling and building with fire bricks. It was a real community venture and the opening ceremony was extraordinary – over 200 people attended to show their gratitude along with the Deputy Chief of the community.